BionX Pedelec Conversion Kits: From bike to electric bike the simple way. We inform you about motors, batteries, technology and upgrades for these conversion kits . New 2014 models now available from us. Motor and battery have received and upgrade. All BionX motors now have a cassette and do not need a screw-on freewheel anymore. The conversion kit battery has been upgraded by a "deep sleep" function and preserves more energy during the operation of the electric bicycle. BionX Conversion Kits - the difference from other e-bike conversion kits. Pedal force support. When pushing the pedals the e-bike motor will add a certain percentage of one's own force. This enables an unbelievably natural ride feeling. The e-drive. The BionX P motor features an outstanding combination of light weight and high efficiency ideal for support on steep slopes. The system. 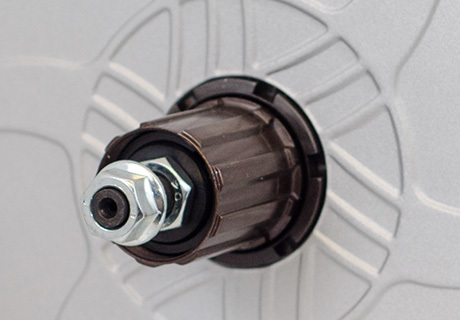 The conversion kit excels by system components very well matched to each other. Be it console, motor or battery their work in perfect sync is a joy when riding. The conversion kit is well-known for its natural ride feeling than almost is no different from that of a conventional bicycle. This is enable by a sophisticated system including a special sensor technology that measures the force applied by the rider which is then supported by the motor with an according energy percentage. These percentage rates are adjusted via four levels of support, that enable a very good modulation of the e-drive's power. BionX P motors feature a low energy consumption and an additional integrated recuperation. The elegant batteries do not only excel by design. Great range and short charging cycles make this e-drive suited for everyday use. Generation "P": The new motor for your pedelec/e-bike. The BionX P motor was especially developed to achieve high power and low weight at the same time. With equal power ratings, this new version is 25% lighter than the G1 motor of the first generation. This is not the only advantage of this electric motor: Since it is a rear wheel motor the bike will keep its usual handling thereby increasing riding comfort. Due to the fact that BionX motors are direct drives, they run very quiet and with low vibration. In addition they have a built-in energy recovery feature, called recuperation. The motor will support you with up to 300% of your own effort making it a great help in uphill sections. 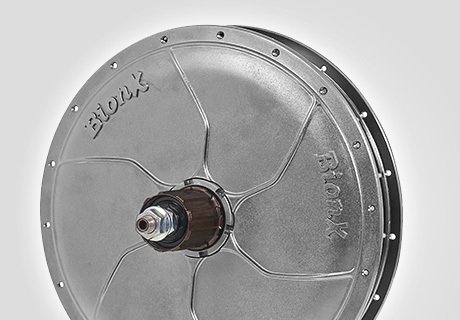 All BionX motors can be retrofitted with disc brakes. All these properties make the BionX P motor a powerful motor with efficient use of energy and pleasant riding dynamics. We recommend it for daily riding and touring in flat and hilly terrain as part of a normal conversion to electric bike or even to e-mountainbike. New models now feature a cassette mount so you don't need a screw-on freewheel anymore. The cassette motor is compatible to a common 9- and 10-speed cassettes from Shimano or Sram. Just like our own custom tailored batteries, BionX energy storage technology is based on highly modern lithium-manganese cells that due to their high energy density enable the production of a light and easy to handle battery with great range. Thanks to their large capacity especially sports batteries provide enough potential fro perfect support on long tours and stressful climbs. In test tours we were able to ride 90km (56mls) with one charge. By using recuperation you can get even more range from your BionX battery. Recuperation restores energy generated by braking and riding directly into the battery. With the included charging device the system can be recharged in three hours on the road or at home. also the original batteries excel not only by their outstanding performance but also by their exceptional design. Be it on the pannier rack or frame triangle, BionX batteries always look great. BionX batteries now feature a "Deep Sleep" function. Depending on remaining capacity and inactivity the battery will automatically turn into deep sleep mode so it does not loose any energy when not in use. Fully loaded this battery can be stored for at least 18 months. This way you maximise energy savings. Then, when you want to use your pedelec again, just plug-in the charging device. *manufacturer's data At 423Wh, we assume 50km (30mls) in hilly terrain and 85km (56mls) in the flats. The Bionx system is controlled by the G2 console. The user-friendly control element displays speed, ridden distance, average speed and total distance. Additionally it features several different ways to setup the support levels so you can specifically adapt your BionX system to your needs. The display is clearly arranged and informs you about remaining battery capacity and selected level of recuperation. The console's LCD display is rich in contrast and can be illuminated at the push of a button, so you can perfectly read it even at night and bad weather. BionX Conversion Kit features pedal force support A sensor inside the motor axle measures speed but also the actual pedalling force. The motor will deploy support proportional to this force. When you pedal harder the pedelec system will provide support correspondingly. With less effort the system will lower the amount of support. The sensor is able to precisely measure force and specifically modulate power. This technology provides bikes equipped with Bionx drive with a very comfortalbe ride feeling.